Finally, yesterday, Adobe announced the release of Lightroom mobile for Android phones! Before you get too excited, it isn’t available for Android tablets… yet. But hey, phones is a great start! Like Lightroom mobile on the iPad & iPhone, it allows you to sync your photos from Lightroom 5 on your desktop to the Lightroom Sync cloud, and back down to your mobile devices. Using the Smart Preview technology introduced in Lightroom 5, smaller versions of your photos, including raw files, can be synced to your mobile device without taking up too much bandwidth or space. Once the photos have downloaded to your phone, you can browse through them while relaxing on the sofa, traveling on the train, or even sitting on the beach. If you know you’re not going to have internet access, you can cache them for offline use. Unlike many other apps, however, you’re not just limited to browsing. Lightroom mobile allows you to refine your photos, marking them with flags and star ratings, and those changes are automatically synced back to your desktop Lightroom catalog. It can be difficult to decide whether a photo’s worth keeping without first making some basic Develop adjustments, so Lightroom mobile goes further, allowing you to edit the photos on your phone. And like the flags and stars, these non-destructive Develop settings are also synced back to the desktop. Then you can organize the photos, copying or moving them into different collections. These groups of photos appear in the Collections panel when you return to the desktop. Finally, you can share your edited photos with others directly from your phone, displaying a slideshow, sharing via Facebook, Twitter or email, or by sending them to another app of your choice. But what if you’ve shot some photos using your phone? Lightroom can import any JPEG or PNG files and upload them to your Lightroom desktop catalog automatically, so you don’t even have to wait until you get home to start editing them. Lightroom for mobile doesn’t offer the same feature-set as Lightroom for desktop. Mobile apps are better for their simplicity, and some tasks are better suited to a touch environment than others. It’s early days, and the mobile app will grow over time, just like its desktop companion. The first Lightroom public beta for the desktop didn’t even have a crop tool, but look at it now! Having uploaded your photos to Lightroom Sync, you can also view the galleries in your web browser, and share certain links with friends and family. Simply visit http://lightroom.adobe.com using any web browser, and log into your account. 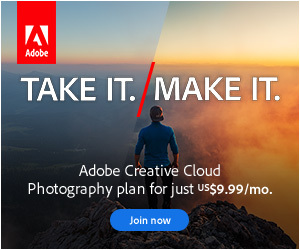 The best news is it’s FREE if you have a Creative Cloud subscription, either for the full Creative Cloud or for the $9.99/month Photography Bundle. That bundle is a fantastic deal! The Photography Bundle includes the latest version of Lightroom (so that’ll include LR6, when it’s released), the latest version of Photoshop CC, 2GB of CC cloud space, PLUS it now includes an unlimited amount of Lightroom Sync space. If you’re not keen on subscribing to software, that’s ok. Lightroom mobile does require cloud access, so you would need to sign up for the Photographer’s Bundle if you want to use it, but you can still keep your perpetual license for Lightroom, and just use the Lightroom Sync space part of the cloud subscription. You might even be tempted to play with Photoshop CC. And there’s a 30 day trial, so you can test it for yourself before making a decision. So how do you get started? You’ll need to be running Lightroom 5.5 or later. Click the Identity Plate to sign in with your Adobe ID, then add a special sync checkmark next to the Collections you want to sync. You can watch the upload progress in the Activity Center. Then go to the Google Play Store and download the Lightroom app. For advanced users, there are cheat sheets showing all of the touch commands, including a few hidden tricks, and there are also some geeky workarounds for Lightroom mobile’s limitations. If you’re more technically challenged, don’t worry, it also covers everything step-by-step using my popular conversational FAQ format. The Lightroom mobile for Android book costs just £3.95 GBP – or $6.45 USD* – and it comes in 3 popular eBook formats (PDF, ePub, Kindle). I’ll continue to update it as new version 1 features are added. Even if you’re not sure whether Lightroom mobile will fit into your workflow, you’ll have all the information you need to quickly make a decision. Tempted? Here’s the purchase link to download your copy. The Lightroom guide for Android only appears to be available as an E Book and not also as a PDF as stated ? Hi Phil. Do you mean on the purchase page? PDF is an ebook format, so when you buy the ebooks, you get PDF, ePub and Kindle formats. That way you can use whichever suits you best. One thing that I’m a little confused on with the Android version. When you sync photos taken on your phone to the cloud (and then onwards to the desktop version) is it uploading the full size file? As I read it, you are uploading a smaller version that is big enough to create a smart preview. If that’s the case if I go onto work on that image on desktop and then export the finished version am I working with an inferior size file in effect? I don’t know if I’ve explained myself well! Yes, it’s uploading the full size from the phone/tablet, so your full res originals get safely back to the desktop. In the opposite direction, any photos on your desktop just go to your phone/tablet as lower res smart previews. The default file save extention on Android is .jpeg, can that be changed to .jpg ? Not in Lightroom, unless you can possibly change it in the OS settings somewhere. Not in the OS settings and it seems an odd choice since virtually all the other Adobe products save as .jpg formats. The reason I even bring it up is the share capabilities with Tumblr. Seems Tumblr will not post a jpeg file but does not return an error either. As a workaround I just open it in PhotoShop Express, save it and share the resulting .jpg file. In that case, post it as a bug at the Official Feature Request/Bug Report Forum at http://feedback.photoshop.com/photoshop_family.